With inspiration from extra terrestrials like Prince, David Bowie, Grace Jones, Boy George and George Clinton, The Illustrious Blacks have arrived with a mission to fuse futuristic funk, hypnotic house and cosmic pop into pulsating positivity for the planet. The real life married couple are not only co­-pilots on their artistic voyage, but are united in their fantastical journey through life. 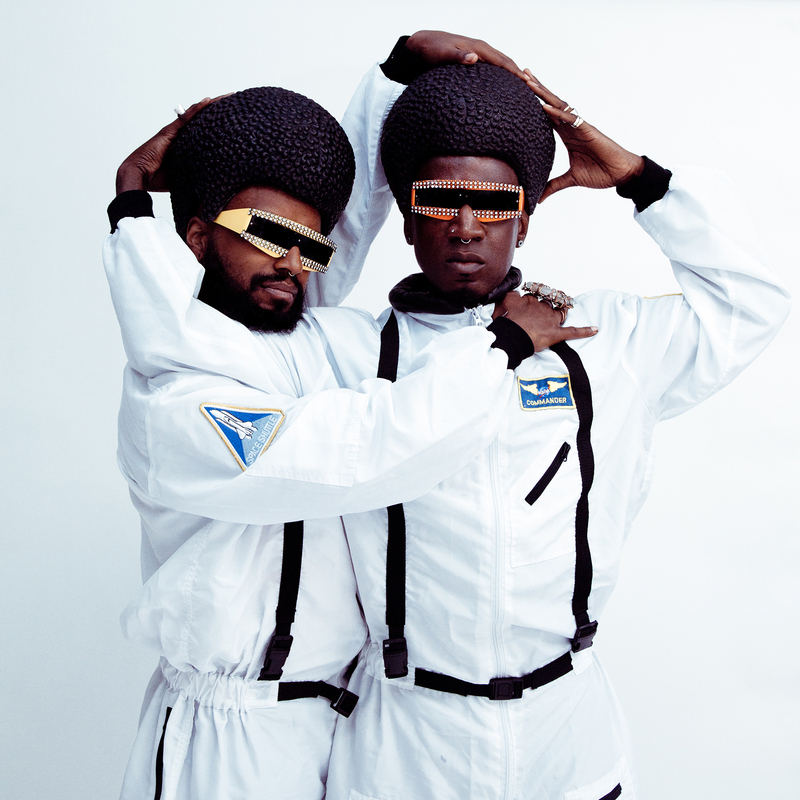 The acclaimed duo found even more praise for their epic live shows, which fuse music, dance, theater & fashion as the ingredients to expand minds, shake bootys and save the world one beat at a time. Toward the end of summer 2017, The Illustrious Blacks landed their live show Hyperbolic for a three month residency at the legendary Joe’s Pub at The Public Theater. “As he searches for his own promised land, Manchildblack might be on the road to delivering us all.” – Jason King (NYU-Tisch School of the Arts, Clive Davis Department of Recorded Music). As a recording artist, impresario, tastemaker and DJ, Manchildblack is a true renaissance man. He has released three acclaimed EP’s: Awake In A Dream, My Mind’s I and Love Reigns Vol. 1. The music video for his soulful single “To The Sky,” received heavy rotation on BET J/Centric. Manchildblack is the Creative Director of Hype Life Music, which co-produces the long running dance party Libation, as well as his own DJ residencies: Astro Beat and Get Together, the latter alongside DJ Afro (Los Amigos Invisibles). These popular nightlife events are inspired by Manchild’s fascination with 70s and 80s New York nightlife, where people of different races, sexual orientations and backgrounds came together to dance and fellowship to the sounds of Disco, Funk, Punk, New Wave, Jazz and early Hip-Hop. He recently launched the annual Hype Life Music Fest, dedicated to showcasing and celebrating black and brown artists in dance and electronic music. The 2016 festival garnered press coverage from news source NBCBLK. Manchildblack and HLM has curated and produced events for the Apollo Theater, SOB’s, AFROPUNK, Webster Hall, The Studio Museum In Harlem and has featured acclaimed DJs like Louie Vega, Black Coffee, Osunlade, Rich Medina and many more. As one half of The Illustrious Blacks, Manchildblack and his husband, Monstah Black, co-host the weekly radio show On Air w/The Blacks for WBAI 99.5 FM in NYC. 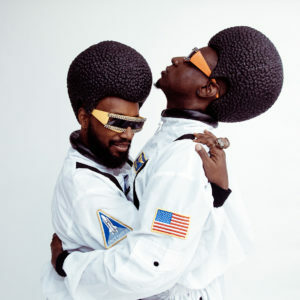 Known for their electrifying live performances, the dynamic duo have released the singles “Black Like Jesus” on Hype Life Music, “Take Me Ovah” on Get Up Recordings and “Delusions of Grandeur” on Royal Advisor Records. In recent years, Manchild has become an in-demand DJ spinning a seamless mix of House, Disco, Funk, Afrobeat and Techno alongside legendary spinners Kerri Chandler, Francois K., Hot Chip, Derrick Carter and Dimitri From Paris. He’s also provided opening sets for concerts by musical artists Meshell Ndegeocello, Seun Kuti, Jesse Boykins III, Tortured Soul & the incomparable Roy Ayers. In 2014, he was selected to be one of the faces of l’oreal’s Magic Shave print campaign, shot by famed photographer Jamel Shabazz. Reginald Ellis Crump a.k.a Monstah Black is a multi-dimensional performing artist known for his stage performances that blur the lines of genre and gender. Born and raised in historical Colonial Williamsburg, Virginia, Monstah was exposed at birth to not only the pulpit rocking sounds of the southern Baptist Church and the classical sounds of Roman Catholic Church but also Soul, R&B, Rock, Funk and Disco. His aesthetic reflects this upbringing revealing influences of Prince, David Bowie, Grace Jones and Sylvester. He fuses his love for music, movement, fashion and visual art in his funk drenched musical creations. As a pre-teen Monstah became the personal high heel stretcher for his mother’s new heels, spending evenings parading through the house in “mothers new pumps” while grooving to hits on Music Television. By 16 he was terrorizing the halls of high school in stiletto boots, safety pins and exercising his desire to be a NewRomanticAfroGypsyPunkFunkDiscoGlamRockStar. He trained in Choreography, performance while in undergrad @ Virginia Commonwealth University in Richmond, Virginia. Using performance art as a way to enhance his music, after graduating, Monstah moved to Washington, DC and began creating performances under the moniker Bedrock Goes Ka-Boom while simultaneously dancing for local dance companies and performing in Nightclubs. Monstah was commissioned by The DC Commission on Arts and Humanities to create his one man show entitled The Acid Box Cabaret. This opportunity lead him to creating a site specific Punk Funk Opera entitled Delicious Hunger, Hunger Delicious, performed in the lobby of The National Theater in Washington, DC. The Opera featured some of DC’s well known musicians, poets, dancers, strippers, nightlife freaks and several students from George Washington University dance department. After years of experimentation in DC Monstah re-located to New York City and chose to focus on producing electronic based music using a 505 Groovebox Sequencer. With a thumb on electronic music Monstah combined musical compositions with his kinesthetic and visual ideas. He began creating otherworldly performances mixing 70’s Sci-Fi, Funk, Punk Rock, Post Modern Dance and physical theater with elements of underground club culture and fashion. Out of this experimentation he produced four un-released albums (This Suite Divine, Black Strap Molasses, Skipping Backwards and Living Outside The…) Choosing to never release the soundtracks, only performing live with the exception of the occasional mix tape that was given to or sold to close friends and fans, Monstah created musical events that happened only once and then disappeared. In 2011 Monstah Black collaborated with composer Major Scurlock on the creation of Black Moon. Black Moon is an Electro-Funk Chamber Opera that remixes the life of Pierrot Lunaire as an African American male vaudevillian performer. This works creation was supported by the Dance New Amsterdam Artist in Residence program. Monstah has received numerous awards including the Tom Murrin Performance Award, Franklin Furnace Fund, Queer Arts Mentorship Fellowship, BRIC Media Artist Fellowship (Brooklyn), Lower Manhattan Cultural Council, American Music Center Live Music for Dance Program, The District of Columbia Commission on The Arts and Humanities, Career Transitions for Dancers, Topaz Arts Center, NYSCA and has garnered extensive support from New York Organizations including The Thelma Hill Performing Arts Center, The Field, Dance New Amsterdam, New York Live Arts and is a graduate of the Long Island University New Media Art and Performance, Master of Fine Arts Program.